The global market for cardiac rehabilitation features a largely consolidated vendor landscape, with the top four vendors, namely Brunswick Corporation, Technogym, Johnson Health Tech Co., and Amer Sports (Precor), accounting for a massive 70% of the overall market in 2015, observes Transparency Market Research in a recent report. The high level of competition is compelling leading vendors to expand across emerging economies with attractive growth opportunities as a way of ensuring sustainable returns. Instances of mergers and acquisitions by companies willing to enter high-growth economies such as India, China, and Japan have increased in the past few years. With few legal barriers to establish footing in the global market for cardiac rehabilitation, the threat of new entrants is high. In the next few years, the market is expected to witness the entry of new small- and medium-scale companies operating in mature segments such as cardio fitness equipment, further intensifying the level of competition. Transparency Market Research states that the global cardiac rehabilitation market will exhibit a healthy 5.4% CAGR over the period between 2016 and 2024, rising from a valuation of US$1,010.93 mn in 2015 to US$1,622.9 mn by 2024. In terms of the types of devices used for cardiac rehabilitation practice, the segment of elliptical trainers presently dominates, accounting for a significant 27% of the overall market in 2015. The segment is expected to continue to witness a significant rise in demand on a global front, exhibiting a 6.0% CAGR from 2016 through 2024. 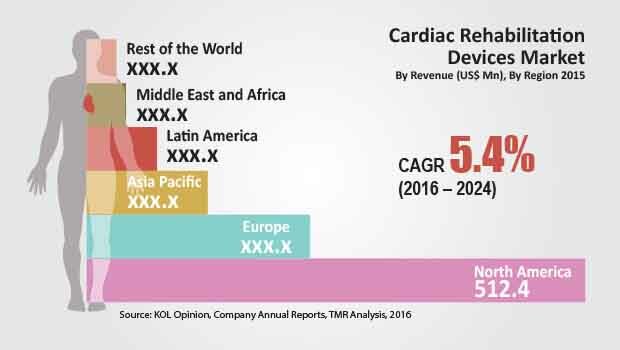 From a geographical perspective, the market for cardiac rehabilitation in North America is presently the dominant contributor of revenue to the global market. The regional segment held a massive share of more than 50% in the global market in 2015 and is expected to retain dominance over the report’s forecast period as well, chiefly owing to the rising population of geriatrics and increased prevalence of cardiovascular diseases. Nevertheless, emerging economies across Asia Pacific, Africa, and Latin America are expected to lead to promising growth opportunities owing to increasing awareness. The world’s population of people aged more than 60 years is rising at a rapid pace, upping the risk of cardiovascular diseases as aging has a major impact on the body’s cardiovascular system. This factor is also the root cause of the increasing rates of morbidity, disability, mortality, and a substantial rise in the world’s healthcare costs. According to the Institute for Health Metrics and Evaluation, the world’s geriatric population suffered a 55% rise in deaths due to cardiovascular diseases between the period of 1990 and 2013.
WHO statistics, on the other hand, highlight another major concern – the high prevalence of cardiovascular diseases and resultant rise in deaths in developing and underdeveloped countries. Low- and middle-income countries in developing and underdeveloped parts of the globe account for a staggering 82% share in the total number of deaths caused due to non-communicable diseases across the world; of these, cardiovascular diseases account for a massive 37% share. Driven with the aim of improving the situation, sustained efforts for preventing and treating cardiovascular diseases undertaken on national and international levels will have a major impact the global cardiac rehabilitation market in the future. Being a highly capital- and research-intensive marketplace, cardiac rehabilitation products, quite naturally, carry a high price tag and always carry the risk of being outclassed by newer and most often technologically advanced products in the market. In this highly dynamic market, where the rate of introduction of technologically advanced varieties of product types is immense, the high and rising costs of cardiac rehabilitation products are a major restraints for further expansion. Cost is a major constraint especially for the market’s growth in developing regions such as Asia Pacific and Latin America.